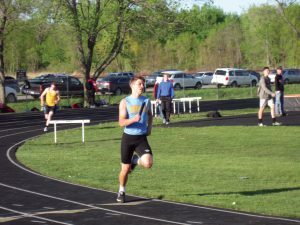 The L-S track boys have been on a roll as of late, winning every meet except one this year, and that continued at the SICL meet in Marengo last Tuesday. Defeating Belle Plaine by 19 points and Montezuma by 20 points, the Hawks were the 2017 SICL champions, repeating their 2016 conference championship. The boys came home with five conference champion events. “It was a little windy, but a great night for the Hawks to fly high as we found a way to bring home the 2017 SICL title! Winning the conference team title is a great accomplishment for this team, and it is something we hold very highly here at L-S,” said head coach Mike Parkinson. 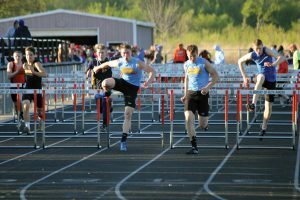 Senior Ryan Hofer edges out teammate Gage Vander Leest, a sophomore, for the conference title in the 110-m high hurdles. The sprint medley relay placed first with sophomore Nate Stock, junior Sage Zylstra, sophomore Tyson Vander Linden, and junior Corey McCoy in 1:39.15. The shuttle hurdle relay finished in 1:02.70, placing first with sophomore Gage Vander Leest, junior Carson Dunsbergen, and seniors Caden Dunsbergen and Ryan Hofer. Hofer placed first in the 110-m high hurdles with a time of 15.48. In the 400-m hurdles, Vander Linden claimed the title with a time 58.19. Vander Leest, Hofer, Carson D., and Vander Linden were part of the winning 4x400 relay team with a season-best time of 3:36.34. “Being part of the 4x400 relay this season has been full of excitement since we haven’t lost a race this season. As a team, we have dealt with some injuries and had some great accomplishments,” said Vander Linden. Sophomore Rylan James placed second in the shot put, throwing a personal best of 46’10.25”. In the 400-m dash, Vander Linden placed second in 51.86. Vander Leest placed second in the 110-m high hurdles with a season-best time of 15.77. 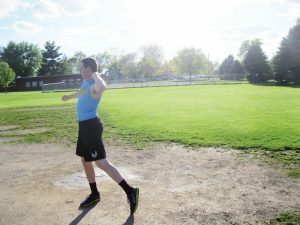 Sophomore Rylan James throws the shot as he places second in the SICL last week. Junior Carson Dunsbergen runs the 400-m leg of the distance medley at the SICL Conference meet last Tuesday, May 2. Junior Jesse Van Wyk threw the discus 115’01” to place third. Carson D. placed third in the high jump, clearing 5’10”. The 4x800 relay placed third with a time of 9:15.21, with juniors Brevin Hansen, Drake Ehresman, and Cody Gibbs and senior Luke Jones on the team. Hansen placed third in the 400-m hurdles with a personal best time of 1:01.23. Five L-S events came in fourth. Ehresman placed fourth in both the high jump and long jump, clearing 5’8” for high jump and leaping 17’4” for long jump. The distance medley relay (junior Kemper Lukehart, freshman Kinnick McFarland, Carson D., McCoy) placed fourth with a time of 3:54.37. The 4x200 relay ran a time of 1:39.54, placing fourth. Teammates were Caden D., Hansen, Ehresman, and Stock. McCoy placed fourth in the 800-m run with a time of 2:11.15 while battling bad shin splints. The 4x100 relay placed fifth with a season-best time of 46.37 with Caden D., Hansen, Stock, and Zylstra. Last Thursday, the L-S boys track team competed at the Cardinal Relays in Newton. The Hawks placed second with 105 points, losing only to Newton, who had a score of 150. Third place was PCM with 102, followed by CMB, North Mahaska, Pleasantville, Colfax-Mingo, and Southeast Warren. “We ran really well in our respective events. This is always a great meet for us to compete and go against some really good teams and push ourselves even further,” Parkinson said. The Hawks won five events. In shuttle hurdle, it was Hofer, Caden D., Carson D., and Vander Leest won with a time of 1:02.88. Vander Linden claimed the 400-m dash with a time of 51.71 as well as the 400-m hurdles with a new personal record of 55.84, followed by Hofer in second in 1:03.42. Hofer also took the win in the 110-m hurdles with a new personal record time of 15.05. The Hawks also had two other runners place in the 110-m hurdles with Vander Leest placing fourth (15.81) and senior Colten Arment in fifth (16.22). The Hawks also took the win in the 4x400 with runners Vander Leest, McCoy, Carson D. and Vander Linden finishing in 3:31.10. Other events to place were the high jumpers with Carson D. in third and Ehresman in fourth. The Hawks’ only runner in the 3200-m run, junior Josh Dunsbergen, placed sixth with a personal record of 11:29.99. In the 100-m dash, Zylstra ran to a fifth-place finish in 11.96, a personal record for him. The 4x200 team of Caden D., Lukehart, McFarland, and Stock finished fifth in 1:40.85. In the 800-m run, Hansen ran to a second-place finish and Ehresman finished sixth with times of 2:12.64 and 2:22.35, respectively. Stock placed fifth in the 200-m dash in 24.43. The 4x100 team of Caden D., Zylstra, Hansen, and Stock finished fourth in 47.58 seconds. The Hawks run their state qualifying meet on Thursday at Belle Plaine. After a few days off, the Hawks entered one of the biggest weeks of the season with the Darrell Brand Relays at Montezuma on Monday. The L-S boys shared the win with the host Braves as both teams finished with 123 points. It was a good start to a week that also includes the state-qualifying meet on Thursday. The boys racked up seven event wins at Montezuma. Individuals who won events were McCoy, claiming the 400-m dash in 51.83 seconds; Hofer, who won the 110-m hurdles in 15.82 seconds; Vander Linden, who crossed the finish line in 56.13 seconds in the 400-m hurdles; and Ehresman, who cleared 5’8” to win the high jump. Winning relays were the sprint medley (Caden D., Stock, Vander Linden, McCoy) in 1:36.33, the shuttle hurdle relay (Vander Leest, Carson D., Caden D., Hofer) in 1:02.30, and the distance medley (Lukehart, McFarland, Hansen, Ehresman) in 4:01.89. The Hawk distance runners had a strong night at Montezuma. Josh D. and Breeden went two and six respectively in the 1600-m with personal records for both of them – 5:13.99 and 5:27.00. Josh D. also ran in the 3200-m run, claiming third in 12:40.15. In the 800-m run, Gibbs placed fifth in 2:23.15. In the field events, James and sophomore Grant Wehrle threw personal bests in the shot put with marks of 48’ for James, good for second, and 37’8” for Wehrle, good for sixth. Carson D. took second after Ehresman in the high jump after also clearing 5’8” (it just took him more tries). Second place also went to the 4x800 team of Hansen, Jones, Breeden, and Gibbs as they finished in 9:12.40. A third-place finish went to Vander Leest in the 400-m dash, who put up a time of 55.90. The 4x400 team (Jones, freshman Ethan Wyma, McFarland, Lukehart) finished fourth in 4:03.57, and the 4x200 team (sophomore Jason Craver, Jones, junior Elijah Collins, Van Wyk) placed sixth with a time of 1:46.78. With just a couple more practices to go before the state-qualifying meet at Belle Plaine on Thursday, Parkinson was pleased with how his team was looking. “We are healthy and ready for a great night on Thursday night and are focused on what we need to do to take the next step this season,” he said.